It has the potential to be as big an accident as Chernobyl and Fukushima, Iran has heavy water reactors, nuclear sites, research reactors and uranium mines just miles from no fewer than four major tectonic plates (Arabia, Eurasia, India, and Africa) and one smaller tectonic block (Anatolia). Last night a shallow mag 6.0 -struck 64km NNE of Kerman, Iran smack in the middle of three uranium mines and the Bushehr nuclear site. 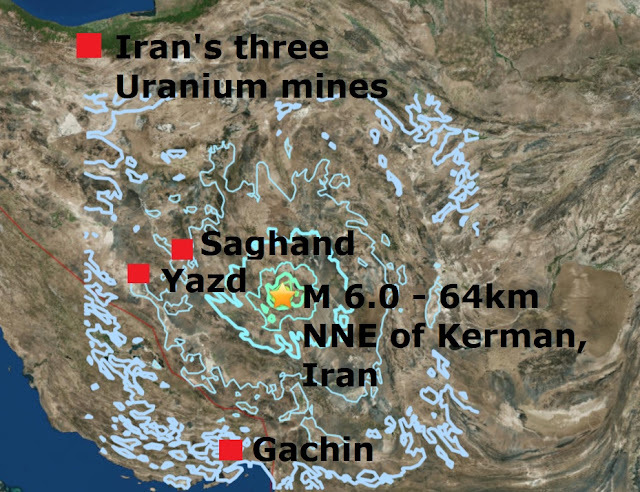 It is the third major quake to strike Iran since November 2017 when a mag 7.3 struck with the epicentre just miles from the Arak heavy water reactor and production plant containing plutonium suitable for a nuclear bomb. Earlier this month three earthquakes hit eastern Iran in quick succession close to Isfahan and Bushehr Nuclear sites, it is surely an accident waiting to happen. Last nights quake bring the total to 7 major quakes in a busy December and the year total to 108 which is easily the quietest year this century for major quakes.